Welcome to The USFL Database, a look back at the late, great USFL, the spring football league that began play in 1983 and lasted for three memorable seasons. This database encompasses all the league's games and all those who played in it. Included are full lineups for most of the league's games. Future enhancements include adding statistics from each season as well as from individual games. February 21, 2018 - Added kickoff return, punt return, interception, punt and sack data for 1983 games. March 29, 2017 - Added stats to player detail page. December 23, 2016 - Added 1984 individual game rushing, receiving and passing stats and made minor corrections elsewhere in the database. 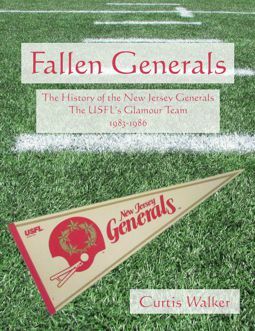 October 31, 2016 - Now Available: My book Fallen Generals, the history of the New Jersey Generals. October 29, 2016 - Added remaining 1983 stats and added most lineups for 1984. August 9, 2016 - Made some minor corrections and added all remaining lineups for the 1983 season.